The pupil is a round opening in the middle of the iris that allows light to pass through the eye to the retina. The pupil constricts or dilates (enlarges) according to the amount of light that enters the eyes, with both pupils normally dilating in dim light and constricting in bright light. Anisocoria is a condition in which the two pupils of the eye are different sizes; in other words one pupil is larger than the other. In some cases, the abnormal pupil may be the one that is smaller and in other cases the abnormal pupil may be the one that is larger. "Anisocoria occurs suddenly, you should seek veterinary care immediately"
If anisocoria occurs suddenly, you should consider this an emergency situation and seek veterinary care immediately to lessen the chance that your dog's vision will be permanently affected. What else might I see with anisocoria? In all cases of anisocoria, the pupil in one eye will be bigger or smaller than the one in the other eye. In some cases, that might be all that you notice. 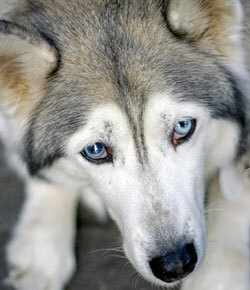 In other cases, depending on the underlying cause, the white part of the affected eye might be red, the cornea might be cloudy or bluish in color, there might be a discharge from the eye, the eyelid on the affected eye might be droopy, the dog might be squinting or rubbing at its eye, or you might notice that your pet is less active than usual. How is the cause of anisocoria diagnosed? Your veterinarian will begin by conducting a physical examination of your dog, including a detailed examination of the structures of the eye. Depending on these preliminary findings, your veterinarian may do some further, more specific testing. 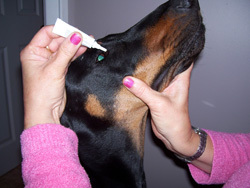 Your veterinarian may measure the tear production and intraocular pressure (pressure within the eyes) for each eye. The cornea may be stained with fluorescein dye to look for underlying corneal injuries or ulcers, and conjunctival scrapings or biopsies may be obtained and sent to a diagnostic laboratory for specialized testing. Blood tests may be performed to determine if the condition is related to a systemic condition. In some cases, your veterinarian may recommend a referral to a veterinary ophthalmologist for further diagnostic testing. The treatment of anisocoria depends entirely on the underlying cause of the condition, and specific treatment will be tailored specifically to the diagnosis. Your veterinarian will discuss the treatment options that are appropriate for your dog's individual circumstances. "Prognosis for full recovery depends upon the cause of the anisocoria." The prognosis for full recovery depends upon the cause of the anisocoria. In some cases, your dog may require long-term medication to control the underlying cause. If your dog became blind as a result of the underlying disease, it is extremely unlikely that the blindness will be reversible.